i began crankpunk so that i’d have a place to vent and so that my friends could follow my exploits as i raced around Asia, but as there are more readers coming each week i feel it’s time i explained who i am. i enjoy writing with the ‘mask’ that crankpunk affords me, but in truth it’s pretty much the way i always write anyway. anyone who read my race diaries on VeloNews and Pez Cycling and other sites would have guessed it was me though, I think. crankpunk is me, Lee Rodgers, Englishman and former professional road cyclist on several UCI Continental teams, based and living in Asia. the day job though comprises of freelance journalism and cycling coaching. i write in the main about this great passion of ours. i say ‘ours’ cos if you’re reading this then i’m presuming that you too are edging the bike-geek-o-meter’s needle dangerously close to ‘this one’s a lost cause’, and no doubt have at least one room in your house that bears witness to your love, manifested through countless sets of wheels, useless busted tires you for some reason keep around, chammy creams in various states of crustiness and endless nuts, bolts, saddles, hex wrenches and on and on and on, and maybe even a few race numbers strewn about too. maybe, unlike myself, your collection is nice and tidy and not looking similar to the compactor room in Star Wars. i’ve probably got three complete bikes in there, in pieces, that are just waiting to be re-discovered… i’ll get round to it someday. i started racing originally over two decades ago, then walked away from cycling altogether when i was 18. i found it hard to contemplate the years of hard work it’d take even if i was to scrape a bare living from the sport, and eventually came to see no real future for myself in what i’d gradually discovered was a drug-addled sport. 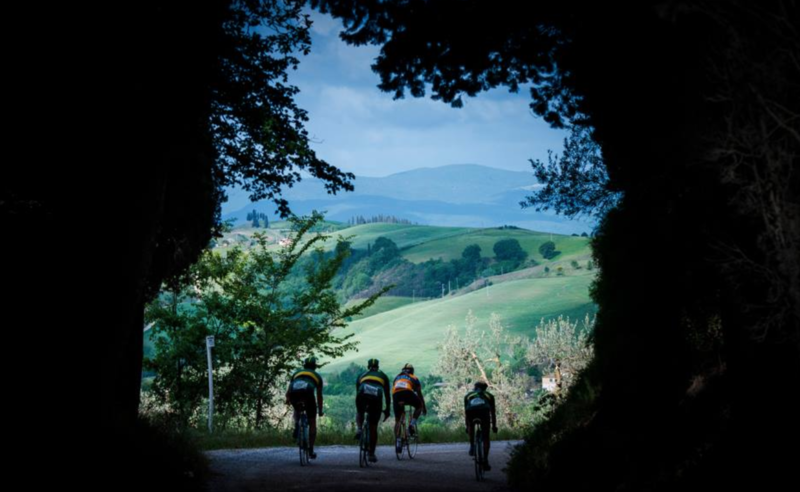 my generation was that of the EPO era, and all i can say on that is that i am glad i never had to make those same choices that so many riders of my generation did – though maybe, when i walked away, i already had. i came back to the sport 19 years later in Japan (where i lived for a decade), purely as a way to lose some weight, but the competitive juices returned. suddenly i was racing wherever i could and doing well enough to get a spot on a Continental team to race in the UCI Asia Tour. i’m not sure but i may have been the oldest neo-pro in the history of the sport. highlights have been many, i have loved racing again and challenging myself to improve, and every ride feels like a gift. i won the Singapore Road Race National Championships in 2010 and the TT version in 2011 and 2013, and raced in 5 or 6 post-tour criteriums in 2012, against guys like Cavendish, Andy Schleck and Samuel Sanchez around cites like Heerlen and Maastricht with 20,000 mad Dutchmen cheering us on. i raced in the tours of Qatar and Oman in 2012, which was just mind-bending, truly – some idiot’s screaming at you in a cross-wind to ‘close the gap! close the ******* gap!’ and you turn around and it’s Tom Boonen. 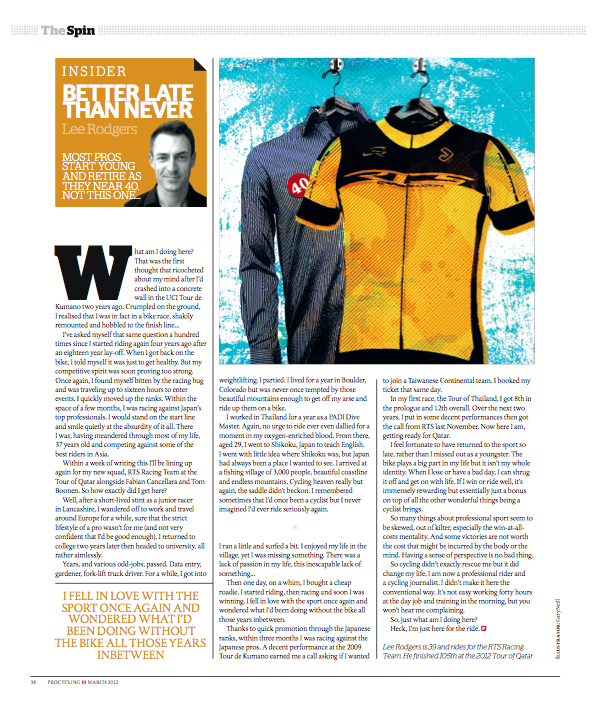 i had a quiet chat with Philippe Gilbert at the back of the peloton one day, rode back from the finish with Thor Hushovd and he said ‘i like your jersey’, and had Fabian Cancellara lean over the table at breakfast and ask me to pass the cornflakes. amazing. i won the 2.1 Tour de Taiwan (which included SaxoBank) Points Classification in 2012 despite not being a sprinter, but by breaking away on 4 of the 7 days. i also got 2nd on the GC at the 2012 Tour de East Java and 3rd on Stage 1 of the Tour of Brunei, where i was on my way to another top 5 GC finish until food poisoning struck and left me with my face slapped up against the toilet tiles for 5 hours. 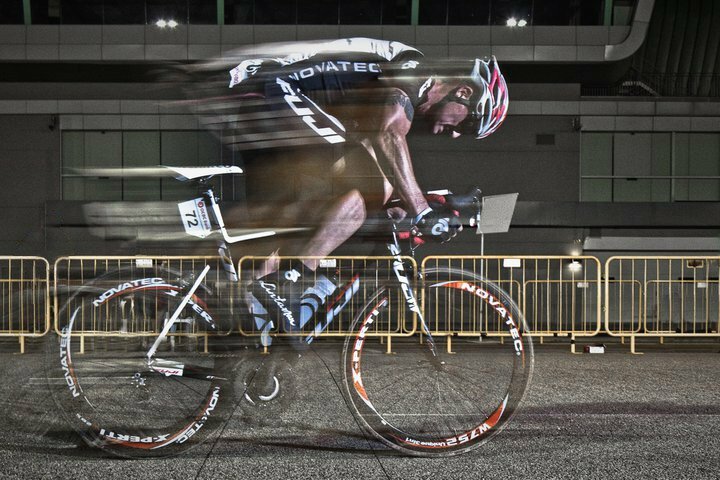 the biggest win of 2012 was at the Hong Kong Cycling Classic in October. 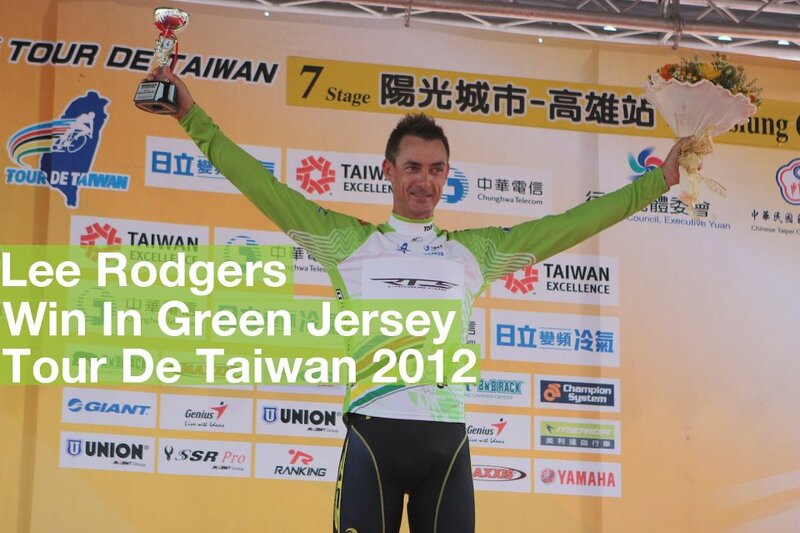 in 2013 i rode as an elite amateur after competing in my last UCI race, the Tour de Taiwan. i managed a GC win at the Tour of Friendship and have been taking a bit of a sabbatical since then, though an MTB epic adventure in Mongolia managed to crop up too. this website came about because i was in between work, getting frustrated at having no space through which to communicate and tired of sitting around all day waiting for my most recent bout of road rash to heal up. the name crankpunk came about because ‘on the rivet’ and ‘my shaved legs’ and just about every other cycling-related name you can think of was gone. but turns out it was quite apt, because i can get quite cranky. not sure about the punk though, let’s just leave that one up for debate. crankpunk.com has become known for being somewhat of an arena for strident opinion on doping and dopers. i sincerely wish that this wasn’t the case, just as i wish that the sport was cleaner than it is. but it ain’t. however, there’s a whole lot more to crankpunk & company, everything from training insights to great cycling videos, articles on cycling history to compositions devoted to our deep and abiding love for this wonderful, beautiful, mad and crazy sport. thank you for reading, thank you for visiting, and thank you for riding. no matter what the bastards get up to, we must remember – this will always be our sport. the sport of kings. SURVIVED! The Tour of Qatar & the Tour of Oman! It sounds like you have many adventures ahead of you! I like the kit too! thanks, that was two teams ago now tho! Great site, stumbled on this today. If this is truly our sport, how do WE bring the true villain Hein Verbruggen to account? Surely as cyclists, we can achieve this. Under Cookson the door might just be slightly ajar for us. The commission? Not sure how yet, but Verbruggen needs to be held accountable to all ( cyclists, families of those who died or are dying, organising bodies, sponsors- everyone who is part of this great sport) for what he has done or enabled to be done. Until we can excise the malignant tumour that is Hein Verbruggen from any position linked to this sport we should not rest. Talk about turning your life around! This is so encouraging for people like me who feel like they should reconnect more with their body through physical activity. I used to but somehow fell off that track, so to speak. You make the 40’s seem like a great time to get in top shape. I’m inspired! I might just join a beginner’s bike club here in Switzerland…I’m counting on it not being too late to shape up and live better.